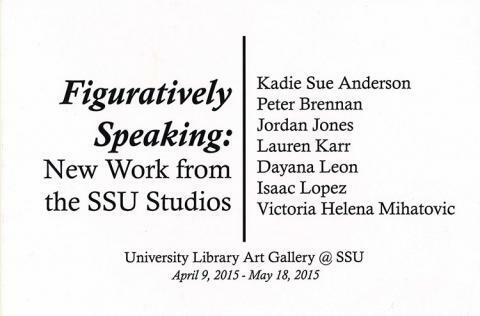 The University Library Gallery's newest show opens Thursday, April 9, showcasing stellar work from seven Sonoma State University students. Figuratively Speaking was organized by Natalie Garcia and Amelia Martinez, both students from the SSU Art History Department, and features artists Kadie Sue Anderson, Peter Brennan, Jordan Jones, Lauren Karr, Dayana Leon, Isaac Lopez, and Victoria Helena Mihatovic. The exhibit runs through May 18, 2015.